Reconstruction of Rochester Shale seafloor depositional environment for transitional community type, slightly deeper than shallowest bryozoan thicket assemblages. 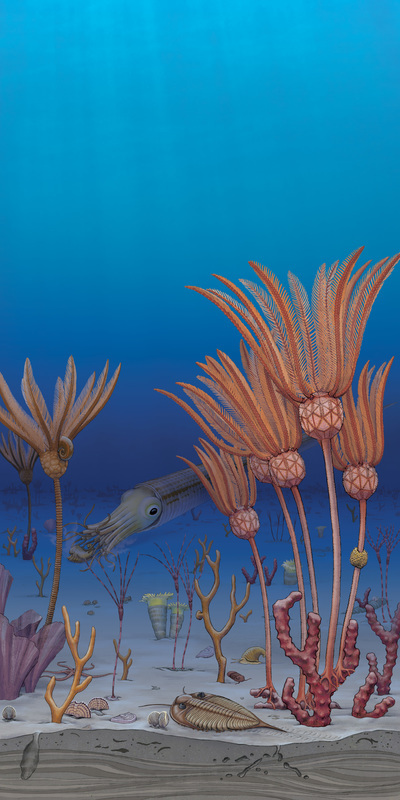 Note local patches of Fenestella (far left), Chilotrypa (center) and Hallopora (far right) bryozoan colonies provide attachment substrates for the cystoid Caryocrinites (right); note small coral Favosites parasiticus, attached to the column of specimen on the far right, and the crinoid Macrostylocrinus (left); note the attached commensal gastropod, Naticonema. Smaller crinoids (Homocrinus) near center of view are attached to small shell fragments. Small solitary rugose corals (Enterolasma), the brachiopods Striispirifer, Atrypa, and Leptaena, and the ophiuroid (brittle star) Protaster, are scattered on the seabed. At the center, the trilobite Dalmanites scuttles along the seafloor and the predatory nautiloid cephalopod Dawsonoceras has captured a platyceratid gastropod. Note burrowing by sediment-feeding worms and a bivalve into the storm deposited, hummocky cross-laminated siltstone in the slice of sediment at base of view.